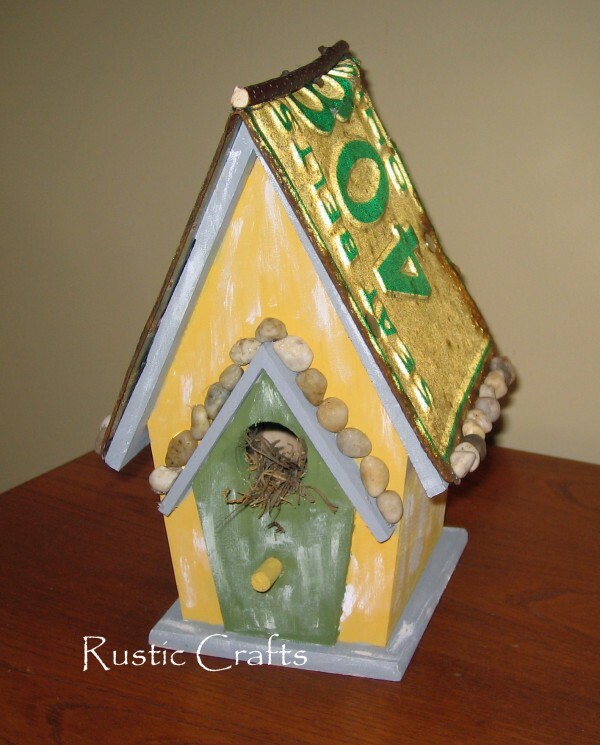 You can decorate a birdhouse very easily with paint. However, adding just a few embellishments can quickly change a style to rustic. Stones, branches and Spanish moss all add some great natural elements which adds to the character of your finished project. 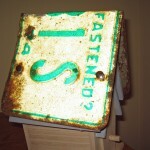 An old rusty license plate adds a little more appeal and keeps with the rustic theme. This easy craft is quick to do and can be personalized to your liking. I bought an unfinished wood birdhouse from Joann craft store for just a couple of dollars on sale. 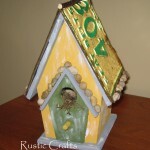 Since I have seen many finished birdhouses at a cost of $15 and up, doing this craft yourself is a pretty good deal. The only other cost is for the paint. You can get small containers of acrylic paint for about a dollar a piece and sometimes even lower. 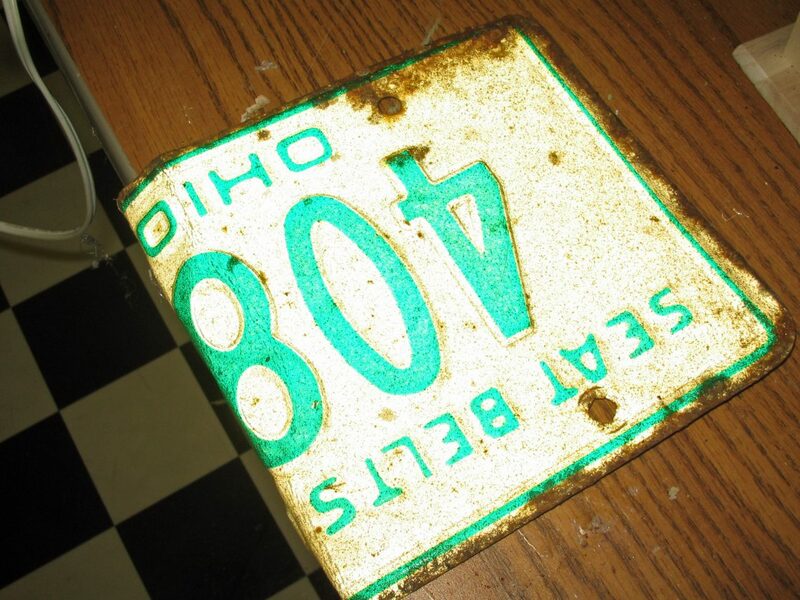 If you have an old license plate that you are going to use, you may want to pick paint colors to coordinate. You can also use a rectangular sheet of rusty tin from the craft store, which is actually a lot easier to bend. Since small stones can easily be found in most places, there isn’t really any other significant costs. If you don’t have access to small stone, these can also be purchased from a craft store. 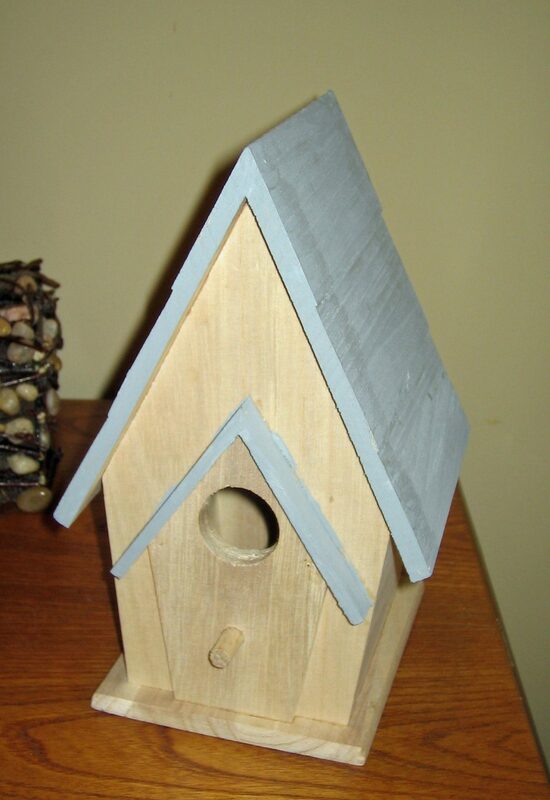 All in all you will still be spending less than purchasing a finished birdhouse. 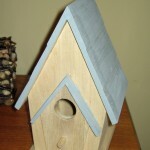 Plus, a custom designed birdhouse will match the decor of the area you are putting it. 1. Paint the entire birdhouse with your acrylic paints. A small angled paint brush works best. 2. Bend your license plate in half. The entire license plate fit on the birdhouse I was decorating. If you have something with a smaller roof, you will want to cut the license plate to size with tin snips. Some license plates can be hard to bend so laying it over the edge of a table will help you to get a straight line. 3. Slip the license plate over the roof and adhere with tacks or small nails. 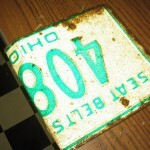 I put tacks through the existing holes of the license plate which was very easy. If you trimmed your plate and need to make your own holes, you may want to drill small holes first. You can see that the plate didn’t quite come all the way to the bottom edge and is a little uneven. This is okay since stones will be glued along the bottom edges for a finished look. 4. The final steps are to add the embellishments and white wash paint. I added my birch branch to the top peak of the roof to give it a definite straight edge. The rocks along the bottom edges finish the “tin” roof neatly. I like to add a little white wash paint over the colored layers to give a little bit of a worn look. Finally, a little Spanish moss in the hole and the project is complete. ***If you will be placing your birdhouse outside you will want to spray on an acrylic sealer or polyurethane to protect the finish. What a great way to spice up a normal looking birdhouse! I have gotten into decorating my back yard with birdhouses, however they all begin to look the same! I will use this technique to add variety to my collection!